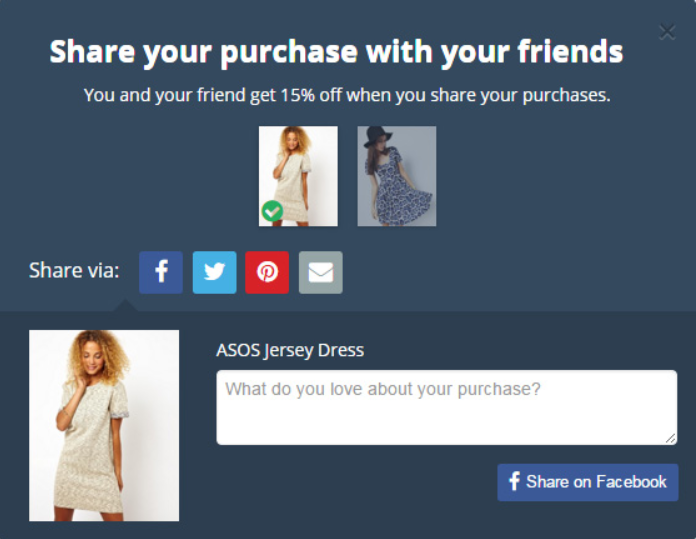 Are social media sharing buttons valuable on eCommerce product pages – or are they a distraction? Here are the pros and cons. Some eCommerce websites have icons/widgets that let you share a post about the product on Facebook, Pinterest, Twitter, and often a variety of other social sites. Usually, there is also an email link. So if I decide I want to share this top on my Facebook timeline, tweet, email or Pin it, I can do it fast by just clicking on the button. This particular page highlights the share icons, making them as prominent (if not more) as the add to cart button. There is no standard about using social media links on eCommerce product pages. Some sites choose to have them, others do not. Amazon (always a place to look for trends in eCommerce design) does use these icons, but you can also find many large, established eCommerce businesses that don’t use them. Let’s weigh the pros and cons. The pros of using these links are pretty obvious. It makes it easy for visitors to share their interest in a product, either with their network or someone specific. It’s a great way to ask for recommendations from friends. The major con to using these widgets is that they can take up valuable page real estate and – at their worst – distract someone from actually making the purchase. Giving online shoppers too many options can backfire, causing people to hesitate. There are studies that show removing these widgets increases conversion rates. But at the same time, it’s safe to assume that if they were hugely detrimental Amazon wouldn’t have them on their pages. One thing to note is that it’s considered a bad practice to show counters (which show how many shares the product has on each network) because it can create negative social proof. If people see that few to no people have shown interest in a product, that may (negatively) influence their decision to buy it. So here is the biggest consideration. Adding these widgets to your product pages is likely to have a minimal impact either way. Our internal data and other studies report that a minuscule percentage of people share product pages using these icons. On sites where the product is something the shopper might want to share (like a fashion site) you might get a bit more activity. On sites where there is little chance someone will share the page (like an auto parts store) these widgets are just taking up space. This makes more sense because now the shopper has something worth sharing – the delight of their new purchase. Also, this tactic has no potential to interfere with the sale itself. If you think there is any chance you might lose a sale by having social share widgets on your product pages, don’t use them. It’s not worth it. Instead, add them to your after purchase thank you page. If social media is a major part of your overall marketing strategy and you sell the types of products that people might want to share, you can use these widgets. Just make sure they don’t detract from the conversion flow of your product page.